BURLINGTON, Ont. – Bryn Murray, vice-president, Wolseley Industrial Canada Inc. (Wolseley Industrial), announced today theacquisition of all of the assets of the pipe supply business Medallion Pipe Supply Company Ltd. (Medallion). Medallion, established in Saskatoon, Sask. in 1992, supplies the mining and industrial sectors with a wide range of pipe as well as grooving and threading systems. Medallion’s Saskatoon location is now part of Wolseley Industrial, and the company is pleased to welcome eight employees to the Wolseley team. General Manager, Gerald Guinan, will continue with Wolseley Industrial, and will serve as branch manager for the Saskatoon location. The Medallion location will report to Jason Santha, Branch Area Manager, Wolseley Industrial, Saskatchewan. 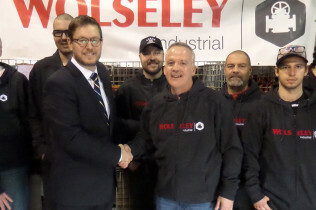 The purchase of Medallion enables Wolseley Industrial to expand its pipe, valve and fittings offering and customer base nationally. On February 8, Wolseley Industrial Inc. acquired Medallion Pipe Supply Company Ltd. Bryn Murray, vice-president, Wolseley Industrial (wearing suit), shakes hands with Gerald Guinan, formerly general manager of Medallion, and now branch manager, Wolseley Industrial Saskatoon.